Austin Nault of the Iron Horse Kindersley Klippers moves across the crease before sliding the puck past Battlefords North Stars goalie Adam Dmyterko to win the home game in a shootout on Oct. 24 at the West Central Events Centre. 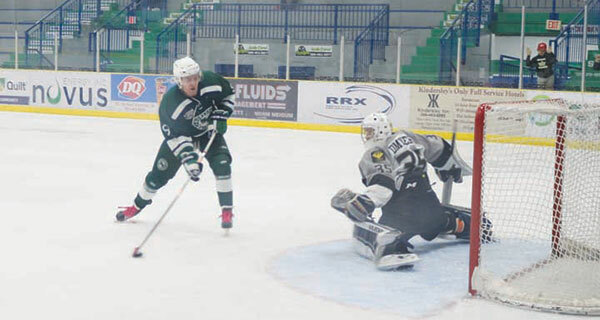 It took two shootout wins last week for the Iron Horse Kindersley Klippers to continue a current hot streak. The team has earned points in nine straight games. The Klippers are 8-0-1 in the past nine games with the only blemish being a 3-2 overtime loss at the hands of the Yorkton Terriers in the first game of the team’s recent six-game home stand that ended on Saturday night with a 3-2 win against the Notre Dame Hounds in a shootout. A five-game winning streak, nine-game point streak and an overall record of 12-3-1 have vaulted the Klippers into first place in the Saskatchewan Junior Hockey League standings and to 16th in the Canadian Junior Hockey League’s top 20 ranking. The team also earned a shootout win at home on Oct. 24 against the Battlefords North Stars, and the game also ended in a 3-2 score. The scores were the same, but the scoring went down differently in each of the wins.